You could win a Kindle Fire 7, Romance Ebook Prize Packs, Amazon Gift Cards, or a Jane Austen Tote in this fun romance giveaway! It’s a new year, romance lovers. 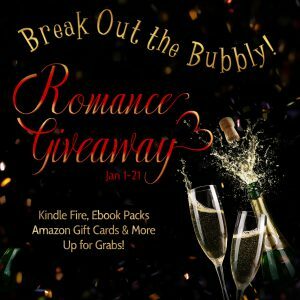 We’re breaking out the virtual champagne to celebrate the 365 reading days ahead with a romance giveaway packed with prizes. Plus, visit our book fair to enter a bonus giveaway, and get to work on your New Year’s resolution to read more books. The book fair is packed with more than 50 awesome romance ebooks all priced at 2.99 or less!